Item: CVA 371-2715 - Officers 62nd Overseas Battalion C.E.F. Group portrait in Victoria Park, showing, left to right: W.S. Rawlings, Parks Superintendent; Unknown; Alderman John Bennett; Mr. Fyfe Smith, Park Commissioner; Mrs. C.R. 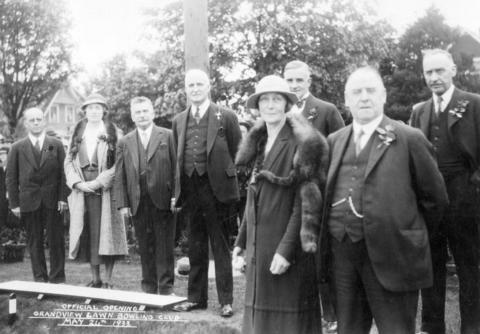 Townley, Park Commissioner; Mr. Graves, Alderman (in back); unknown; and Mr. Cowan, Alderman.